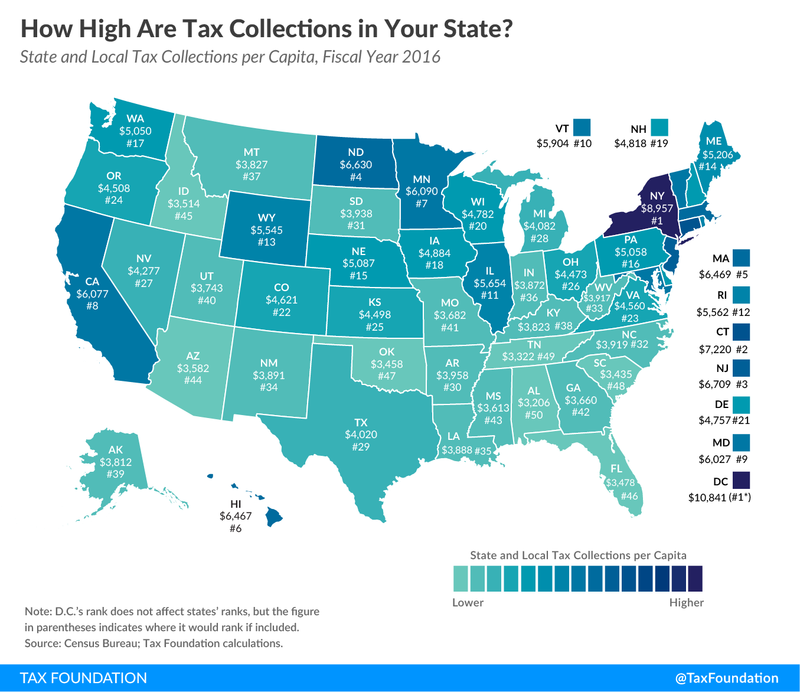 Today’s state tax map shows state and local tax collections per capita in each of the 50 states and the District of Columbia. D.C.’s tax collections per capita ($10,841) are higher than in any state. The five states with the highest tax collections per capita are New York ($8,957), Connecticut ($7,220), New Jersey ($6,709), North Dakota ($6,630), and Massachusetts ($6,469). (Hawaii is 6th at $6,467) The five states with the lowest tax collections per capita are Alabama ($3,206), Tennessee ($3,322), South Carolina ($3,435), Oklahoma ($3,458), and Florida ($3,478).